Hansbrough’s Ridge winter encampment site WILL be preserved! The Virginia Outdoors Foundation, the Virginia Department of Historic Resources, the Civil War Trust and others are working to save Hansbrough’s Ridge, a commanding rampart near Stevensburg that sheltered a big part of the Army of the Potomac in the bitter-cold winter of 1863-64. The site is a Virginia Historic Landmark. The VOF board voted Thursday to give the trust a $250,000 grant toward preserving the 174-acre site, contingent on a conservation easement being placed on it. The property, which stretches from State Route 3 north almost to Cole’s Hill, includes incredibly well-preserved remnants of soldiers’ camps, field hospitals, defensive trenches and a signal station. 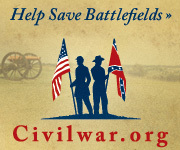 In addition to the VOF grant, a pledge from the American Battlefield Protection Program and the seller leave the Civil War Trust and other preservationists within a short reach of closing this deal. Clint’s article states around $50,000 would be needed to reach the sale price. Hansbrough’s Ridge is one of those “lesser known” and “off the beaten path” sites where one can actually SEE history in situ. Specific to its “battlefield” status, significant action played out across Hansbrough’s Ridge during the battle of Brandy Station. Later in the same year of the war, the ridge became the winter home for portions of the Army of the Potomac’s Second Corps. From late December, 1863 through the first days of May, 1864, soldiers lived on the Hansbrough’s Ridge. When they broke camp there, they marched southeast towards the Rapidan River and the infamous Wilderness of Central Virginia. Those steps down Hansbrough’s Ridge were the first of the Overland Campaign. Similarly, the following winter was important to resting and refitting soldiers of the Army of the Potomac who had been fighting for two years, and to drilling new recruits. “Pristine” is a word often overused, in my opinion, in regard to Civil War sites. There are precious few sites that are, by definition, pristine. I can say that Hansbrough’s Ridge is absolutely the closest I’ve seen to pristine in my forty years of visiting Civil War sites. In my visits, I’ve seen hut sites … not rock piles that were hut sites… but the actual hut sites with the walls as clearly defined as the day the soldiers left. Some of these localities were captured in wartime photographs, offering vital context to what we see on the ground today. We know, based on accounts of the soldiers who stayed on Hansbrough’s Ridge, were those bricks likely came from. But that’s just the “thread” to follow here. It will bring us to the larger story of how those soldiers lived; what they experienced; and most importantly, why they spent a cold, lonely winter on a ridgetop in Virginia. 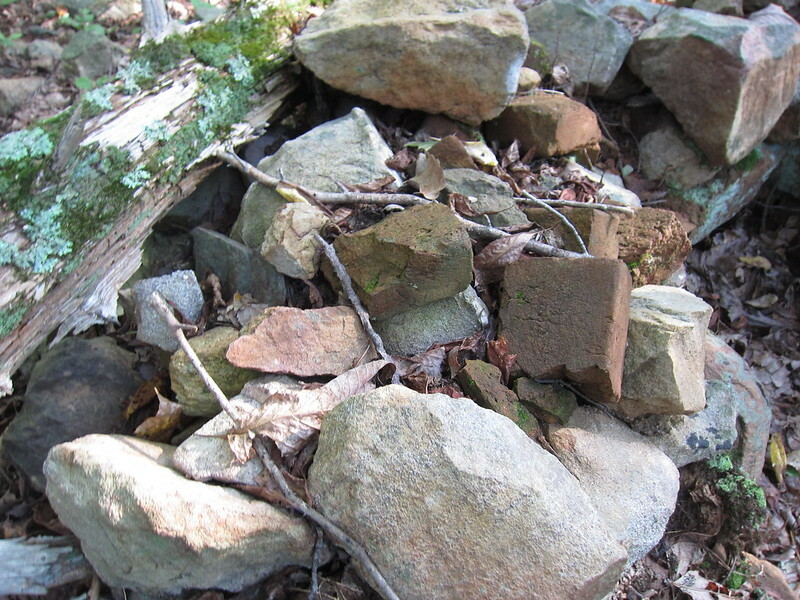 That story is not just one of artifacts or rock-piles, but the context of their presence. There are other reminders – in place, mind you – that speak of the haste as the soldiers broke camp that spring. All of which is why this is an important site to preserve. This site needs to be studied – properly and professionally – not looted by those who would “relic hunt” thus removing context from the artifacts. You see, it is the RIDGE itself, and not some solitary button or dropped musket ball, that will tell this story. The whole RIDGE. And with a broader vision, we consider the efforts to preserve Hansbrough’s Ridge in light of efforts to create a state park for Brandy Station and Cedar Mountain Battlefields. I can see a time when visitors can contemplate both battlefield and encampment while touring Culpeper’s Civil War sites. Ransacking. What does that mean? go hurriedly through (a place) stealing things and causing damage. The photo was taken on November 14 of last year. The location is on the Brandy Station battlefield, at a site which I will not disclose. The site is owned by a preservation organization and is not open to relic hunting or other similar activity. The holes were left by a “digger” who felt the need to step onto posted, marked, and preserved land in order to “get a piece of history” to hold in their hand. I normally try to “frame out” people when taking photos of Civil War battlefields, for functional reasons (as those make better illustrations for blog posts). But in this case, the subject was the individuals in the photo. These were participants in the Diggin’ In Virginia (DIV) XXXII, held on November 13-15, 2015. And as you can see in the foreground, the ground was giving up many long held secrets that day. I cannot state for a fact that the individual who dug the preserved, posted area was involved with the DIV event. But the timing is far too coincidental for this to be random happenstance. Furthermore it is not the first time that myself or others have noticed this sort of coincidental occurrence. Since many of the DIV participants look for “bragging rights” about their finds, there is some desire to show some exciting items retrieved from the ground. So clearly there is motivation for some to go “off the reservation”, if I may, and loot areas that are not part of the event… not to mention legally off-limits. But the nature of the event and the hobby is that those offenses are covered up (… perhaps the ONLY thing these people are likely to leave buried, ironically…). Nobody wants to discuss the illegal aspects of the hobby. Just much shouting about “nectar” retrieved where the machine registers a beep. With measured words, I responded. Because of the nature of the removal, those artifacts ceased to be artifacts at the moment of removal. Period. No matter how great and wonderful the item might be, it is no longer an artifact when its archaeological context is disturbed. Only if surveyed, documented, and analyzed in-situ, does it remain an artifact. Anyone with a Archaeology 101 class behind them, or more than an hour watching “Oak Island” on the History Channel, knows this well. Thus the story, which might have been teased out of those items when they were artifacts, was forever lost. Irretrievably lost. Any value of the items was as scrap metal, unless the owner attempt to “snake oil” a prospective buyer. The other aspect of this, which has impact beyond just the value of what is now essentially scrap metal, is that the site itself was injured due to the ransacking. The artifacts in the ground were components of the history that occurred on that ground. When those of us mindful of history go to those sites with a mind to designate and preserve, we use those artifacts as the source material which validates other research. All too often we are confronted with a conundrum… we know the site was important in an event such as a battle, but to prove such beyond doubt one needs to tie artifacts specifically to the event. Otherwise, one might well say the battle happened over at … say… that fence row… or maybe at the other one. Those sort of suppositions are best supported by documented archaeological surveys. Unfortunately, without the artifacts, there is no story. And without the benefit of supporting artifacts as sources, things such as National Register nominations, which would help secure matching grants for preservation, tend to go flat. I bring all this up today for consideration for a reason. In a couple of weeks, another DIV event will be held on the Brandy Station battlefield. As before, the event is on private property (if you didn’t know, these events play on the margins in the legality of easements and such… but I’ll save that for another day). While I cannot speak strongly enough about the damage the DIV events have done to ransack the history of Culpeper County, I also have to say there’s little I can do about it but complain. That’s our shared history and heritage being ransacked (and in this particular case looting and trespassing to boot!). The “hobby” should identify the individuals who perpetrate acts such as this and make very public examples of them. But I’m not holding my breath… the is a hobby predicted on taking, no matter what the implications. All I can say to those who participate in such is, “then please go prove me wrong.” Name names. Demonstrate where some punitive action is taken. Or provide evidence that will lead to prosecution where a crime occurs. Better still, why not help preservation of these sites instead of ransacking … and thus sabotaging efforts those of us who want the stories to be told. In previous installments about cavalry tactics, we’ve looked at the use of the saber and revolver. Observers such as Alonzo Gray specifically cited these weapons for use in “shock action”. We might say that shock attacks, delivered with either the saber or, less often in Gray’s assessment, revolver, were the most important offensive component to the mounted arm. One might use the carbine to skirmish or develop an enemy position. But it was with saber and/or revolver in hand that the cavalry would deliver its weight against an enemy battle line. It will be noticed that the saber was the only weapon used for shock action except when the ground was unfavorable, such as a close or wooded country. Under such conditions the revolver was substituted for the saber. To secure favorable and decisive results a cavalry commander must make a quick decision and quickly take the initiative. A timid cavalry leader will usually fail where a bold one will succeed. In many cases a bold and sudden attack will result in small losses, and boldness will take the place of numbers. We can apply this sage wisdom to a large number of battlefields from the Civil War. Of those many battles to consider, Gray offered numerous examples from the fields of Culpeper County… of which no small number occurred on Fleetwood Hill. The battery I commanded moved abreast of Hampton’s column in its gallop toward this new foe; and as we came near Fleetwood Hill, its summit, as also the whole plateau east of the hill and beyond the railroad, was covered with Federal cavalry. Hampton, diverging towards his left, passed the eastern terminus of the ridge, and, crossing the railroad, struck the enemy in column just beyond it. This charge was as gallantly made and gallantly met as any the writer ever witnessed during nearly four years of active service on the outposts. Taking into estimation the number of men that crossed sabres in this single charge (being nearly a brigade on each side), it was by far the most important hand-to-hand contest between the cavalry of the two armies. As the blue and gray riders mixed in the smoke and dust of that eventful charge, minutes seemed to elapse before its effect was determined. At last the intermixed and disorganized mass began to recede, and we saw that the field was won to the Confederates. An excellent quote selection by McClellan and later by Gray to illustrate the nature of the fighting. For those who are not familiar with the flow of battle at Brandy Station, June 9, 1863, the charge Hart described was part of the action to drive Brigadier-General David M. Gregg’s division off Fleetwood Hill. Such was the crescendo of combat for the day. And what we see here, in terms of shock action by cavalry, is a textbook case. The charge hit the Federals on the hill and drove them off by close, hand-to-hand action. About 12 a.m. I received information through one of General Stuart’s aides, that his headquarters were in great danger of being captured by a large body of the enemy, which had gotten in the rear. I immediately moved up in the direction of General Stuart’s headquarters, when General Hampton ordered me to move forward at a gallop, and engage the enemy to his front and right. After moving about a mile at almost a full run, I began to ascend the hill upon which were General Stuart’s headquarters. The general sent me the second aide, saying that his headquarters were in possession of the enemy, and desired that I should clear the hill. About this time a regiment of the enemy, which was supporting one of their batteries near General Stuart’s headquarters, swept down the hill, charging my front. I immediately ordered the charge in close columns of squadrons, and I swept the hill clear of the enemy, he being scattered and entirely routed. I do claim that this was the turning point of the day in this portion of the field, for in less than a minute’s time the battery would have been upon the hill, and I leave it to those whose province it is to judge to say what would have been the result had the battery gained its destination. We killed and captured 60 of the enemy, utterly routing him, with but little loss to ourselves. Among the captured were several commissioned officers, including the lieutenant-colonel. Examining the nature of shock action of cavalry, we see another account describing the same charge. Gray did note that Young’s account implied the use of Poinsett’s 1841 drill – close column of squadrons in the charge. The country about Brandy Station is open, and on the south side extensive level fields, particularly suitable for a cavalry engagement. Coming thus upon the enemy, and having at hand only the Third Division (total strength 2,400), I either had to decline the fight in the face of the enemy or throw upon him at once the entire division. Not doubting but that the Second Division was near, and delay not being admissible, I directed the commanders of my advance brigade to charge the enemy, formed in columns about Brandy House. The whole brigade charged with drawn sabers, fell upon the masses of the enemy, and, after a brief but severe contest, drove them back, killing and wounding many and taking a large number of prisoners. Other columns of the enemy coming up, charged this brigade before it could reform, and it was driven back. Seeing this, I ordered the First Brigade to charge the enemy upon the right. This brigade came forward gallantly through the open fields, dashed upon the enemy, drove him away, and occupied the hill. Now that my entire division was engaged, the fight was everywhere most fierce. Fresh columns of the enemy arriving upon the ground received the vigorous charges of my regiments, and, under the heavy blows of our sabers, were in every instance driven back. We see from reading accounts from both sides of the line that on June 9, 1863 Fleetwood Hill witnessed some of the most important “shock action” charges of the war. That’s not my hyperbole. It is derived from the words of the men who were there, mind you. Indeed, we should study the action on Fleetwood Hill with this importance in mind. And how best to study that action? From the very ground it was fought across. And you and I can walk that ground and consider the actions… thanks to the successful acquisition of Fleetwood Hill by Civil War Trust and partners in 2013. In fact, on next Monday, October 26, the Trust officially “cuts the ribbon” on Fleetwood Hill and will show off the new interpretive trail over that most historic topographic prominence. Over the last few weeks, I’ve been working up to what Alonzo Gray called the “shock action” of cavalry when using the saber, and occasionally the revolver. Before breaking down this shock action, as described by Gray, in more detail, allow me to pull up one of his examples… as it is timely to events occurring this very day in regard to preservation. Readers know well the events of June 9, 1863. Often our focus is, for good reason, on the fighting that took place from Beverly’s Ford to Fleetwood Hill. That is the heart of the battlefield. But the fighting around Stevensburg was no less violent or deadly. On the morning of the battle, Colonel Alfred Duffié led the Second Cavalry Division, about 2,000 strong, from Kelly’s Ford towards Stevensburg. His orders were to cover the flank of Brigadier-General David M. Gregg’s main force. Contesting Duffié’s advance was Colonel Mathew C. Butler, with the 2nd South Carolina Cavalry. To protect the road to Culpeper (and hold the screen in front of Confederate infantry), Butler initially placed one squadron on Hansbrough Ridge. When Duffié’s force arrived at the ridge, Butler rushed forward Lieutenant-Colonel Frank Hampton, brother of Brigadier-General Wade Hampton, and a detachment of troopers. When arriving at Stevensburg, Frank Hampton pushed out and posted dismounted troopers across the ridge in front of Salubria, a colonial era plantation house which still stands today. Lieutenant Broughton informed Adjutant Moore that he delivered a message from Colonel Hampton to Colonel Wickham to the effect that he (Hampton) would close back upon the 4th [Virginia] regiment so as to make a charge in solid column. At this moment the rear of the 4th regiment was emerging upon the road from the woods, and the order “By fours, right about wheel,” was heard. Whether this command was given by Colonel Hampton to execute the movement contemplated in the message delivered by Lieutenant Broughton, or whether it was given by some officer of the 4th regiment so as to bring the faces of his men toward the enemy, is entirely uncertain. The result was most unfortunate. Captain Chestnut and Lieutenant Rhett, at the head of Hamtpon’s men, remained facing the enemy, to conceal, if possible, a movement which they felt must bring an attack upon them at once. But the enemy saw the wheel, and instantly ordered the charge. Colonel Hampton again ordered the right about wheel, and placed himself at the head of his men; but it was of no avail. In a moment they were swept to the side of the road, and the full force of the charge fell upon the 4th Virginia. Colonel Hampton, while engaging one of the enemy with his sabre, was shot through the body by another, and was mortally wounded. He succeeded in reaching the house of John S. Barbour, west of Stevensburg, where he died that night. I would submit this as the “vetted” Confederate version of events, carefully reconstructed by McClellan after the war. Though I would point out that others, particularly Wade Hampton, had more pointed views of the actions that took place along the road over Hansbrough Ridge. However, let us set aside for another day the blame for Frank Hampton’s death. Instead, for our purposes of discussing cavalry tactics, let us take this as an example submitted by Alonzo Gray of “shock action” by cavalry. In this case, a charge by the 1st Massachusetts Cavalry landed squarely upon the Confederates and opened the road to Stevensburg. Such offered a great opportunity for Duffié, which he never picked up. Duffié might have uncovered the presence of Confederate infantry. Or he might have rushed to support the attacks on Fleetwood Hill. Or both! 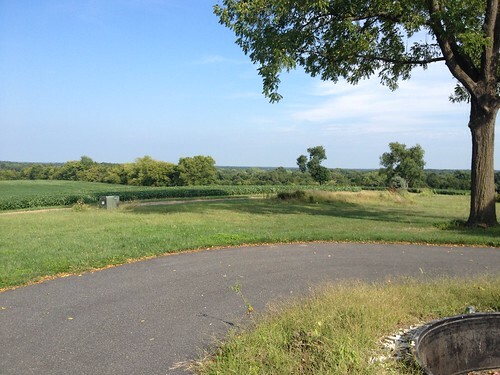 The battle… if not an entire military operation, which we would later know as “The Gettysburg Campaign”… might have turned on actions taken at that moment at that ground where the road to Culpeper passed over Hansbrough Ridge. This view looks down Virginia Highway 3, to the west towards Stevensburg, as it passes over Hansbrough Ridge. The area where Frank Hampton was mortally wounded is just past the telephone pole. 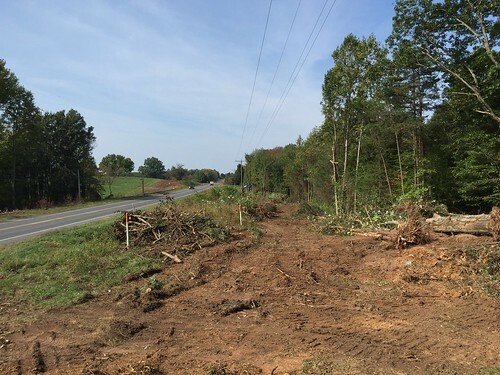 The exposed earth is the result of widening efforts by Virginia Department of Transportation (VDOT). I’ve mentioned (and complained) about this in earlier posts. The widening was, unfortunately, pushed through. In the event that a previously unidentified archaeological resource is discovered during ground-disturbing activities associated with the construction of the Project, the VDOT, in accordance with Section 107.16(d) of the VDOT’s Road and Bridge Specifications, shall require the construction contractor to halt immediately all construction work involving subsurface disturbance in the area of the resource and in the surrounding areas where additional subsurface remains can be reasonably expected to occur. Work in all other areas of the Project may continue. I’ve visited this site a couple times in the last few weeks. Others I know have visited the site. And each of us have made the same comment – there are artifacts being exposed, dug-up, and disrupted by the work. I also hear that now “relic hunters” are now scavenging the work area when the contractor is not on site. For that reason, I’m not going to pass along details of what I’ve seen. You might counter that neither myself or the “relic hunters” are authorities in regard to archaeological findings. Well that’s my point. Implied with the MOA there is supposed to be an authority to determine what, if anything, is being uncovered. This road has seen human activity since colonial times (and likely even before then). Significant activity, in addition to what I’ve mentioned for June 9, 1863, occurred at this spot during the Civil War. Indeed, it would be impossible for no artifacts lay by this road. It’s even possible that human remains lay beside this road. So why isn’t there an observer on site during work hours to determine what exactly the spades and shovels are uncovering? NOTE: This post was badly edited upon first publication. The error was due to cutting and pasting of portions for serialized postings. I’ve revised the post to provide the desired sequencing of Gray’s conclusions instead of Whittaker’s, which were intended for the follow up post. Sorry for the confusion caused by the clean up. Going into combat, the infantryman had his musket and bayonet. One weapon with two different modes of use. The artilleryman had his cannon. One weapon with several types of projectiles for different purposes. 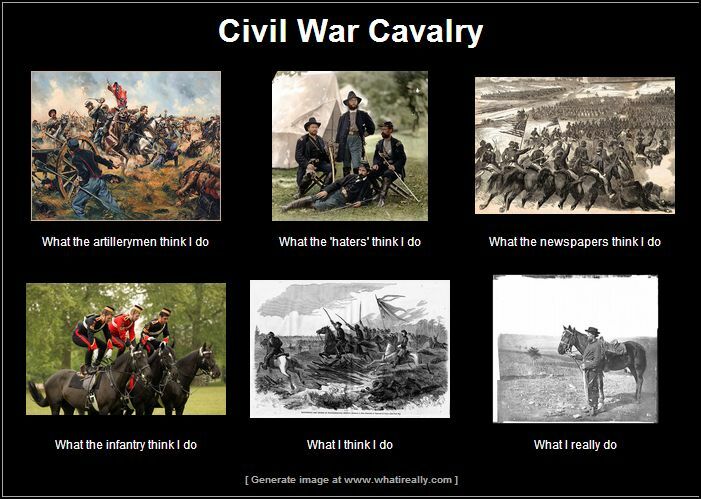 But the cavalryman might, if he was properly equipped, go into battle with a carbine, a revolver, and a saber. (Let’s not go crazy and mention the lances, however). This array of weapons was due to the varying roles the cavalry was called upon to perform. A carbine was preferred for picket duty or skirmishing. But for up close fighting, the revolver and saber were preferred. Though I would point out the commander’s preference tended to play into the selection of saber and revolver. Even today, you mention cavalry and images of gleaming sabers come to the mind’s eye. After all, doesn’t everyone want to be on the horse at full gallop swinging that big edged weapon around? But we read, in most discussions centered on tactics, that the saber was used less during the Civil War compared with earlier wars. However, examining the source material we find the saber was still often employed in the melee. In his study of Cavalry Tactics, Captain Alonzo Gray opened Chapter I with a discussion of the revolver and saber when used for close combat. He took up the question as to when should each be used. Quite number of the actions Gray called upon occurred on June 9, 1863 around Brandy Station, Virginia. Colonel Wickham and a few of his men threw themselves into a field on the roadside, and by the fire of their pistols checked further pursuit. I’m less inclined to call this a successful use of pistols in the close melee, as we know this occurred at a time after the 4th Virginia Cavalry broke, and which General Wade Hampton blamed the loss of his brother Lieutenant-Colonel Frank Hampton. The Federals didn’t press this to advantage, so it’s hard to say the selection of the revolver made much difference. And I’d argue that Wickham’s “stand” really was not much of a stand to begin with, being more of a fleeting rally. Colonel [Frank] Hampton, while engaging one of the enemy with his saber, was shot through the body by another, and mortally wounded. Perceiving his danger, Colonel [B.F.] Davis turned upon Allen with a cut of his saber, which [Lieutenant R.O.] Allen avoided by throwing himself on the side of his horse; at the same moment he fired and Colonel Davis fell. In that instance, along Beverly’s Ford Road, the initiative slipped out of the hands of the Federals. All by way of a single pistol shot. But back from the historical implications here, what does this say about the tactics, drill, and weapons employed? Wryly, do we say “don’t bring a knife to a gun fight?” Well it is not that clean a cut… if I may turn a pun. They outnumbered us three to one, but could not withstand the heavy saber blows of the sturdy men of Maine, who rode through them and over them, gained the hill, captured a battle-flag and many prisoners, among them the rebel General Stuart’s adjutant-general. From this moment the fight was one series of charges, every regiment of the brigade charging, rallying, and again charging until ordered to retire. Granted, we must take Kilpatrick’s report with salt. But in defense of Gray’s selection, the other quotes used for Brandy Station came from Major H.B. McClellan’s Life and Campaigns of Major General J.E.B. Stuart, written after the war. I get the impression Gray was reaching for some account from what one can argue was the largest cavalry melee of the war, and came up with but Kilpatrick’s account to use for his point. What we can agree upon, having access to a wider range of source materials than Gray had in 1910, is that the saber was used to good effect by both sides on Fleetwood Hill that day. Indeed, both sides mounted saber charges and counter charges… with ultimately the victory going to the side that charged last. It will be seen from the next chapter that during the War of the Rebellion, the same as for centuries past, the saber was essentially a weapon for shock action. During the thick of the melee it was still to be preferred; but when the melee began to dissolve into individual combats the saber was or should have been exchanged for the revolver…. In the individual combat the revolver will be the winner in almost every case. If the trooper is expert in its use, he has nothing to fear from an individual enemy armed with a saber. In the end, Gray did not claim the saber was obsolete. Rather that each weapon had a role and place… and should be retained. Put this in context. Those words were published in 1910, just years before the trenches of the Western Front with their barbed wire and machine guns. Now we might wave that aside as backwards thinking at a time when technology had eclipsed the tactics of old. Maybe cast a few jokes at Gray’s expense…. But, the cavalry and their sabers remained on the battlefield… and in some cases were employed with effect. March 30, 1918. Cited as the last saber charge of World War I, Lieutenant Gordon Flowerdew’s C Squadron of Lord Strathcona’s Horse “moved” the Germans at Moreuil Wood with their sabers. They payed a steep price to blunt a German offensive. Nobody, including Gray, ever said cavalry charges were cheap, bloodless affairs.